I couldn't wait to do today's interview. 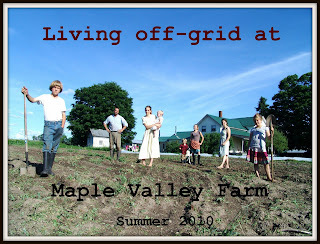 It's about the family at Maple Valley Farm. I've been able to ask questions of someone who is living off grid. As I type this, my air purifier is purring, the dishwasher is taking care of a big load, and the dryer is about to get a few armfuls of wet work clothes. My computer is not exactly solar either. 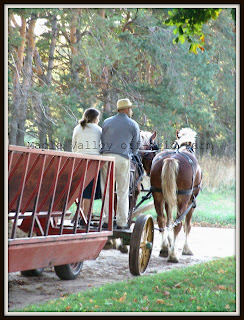 Our Amish friends would laugh at my comments. They're used to living without electricity. 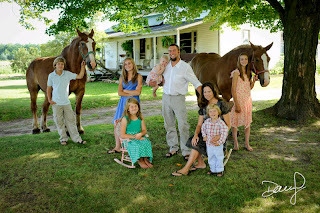 I'm fascinated to learn how a home school family lives that way day to day. I hope you enjoy reading this. 1. Please tell us a little bit about your farm. 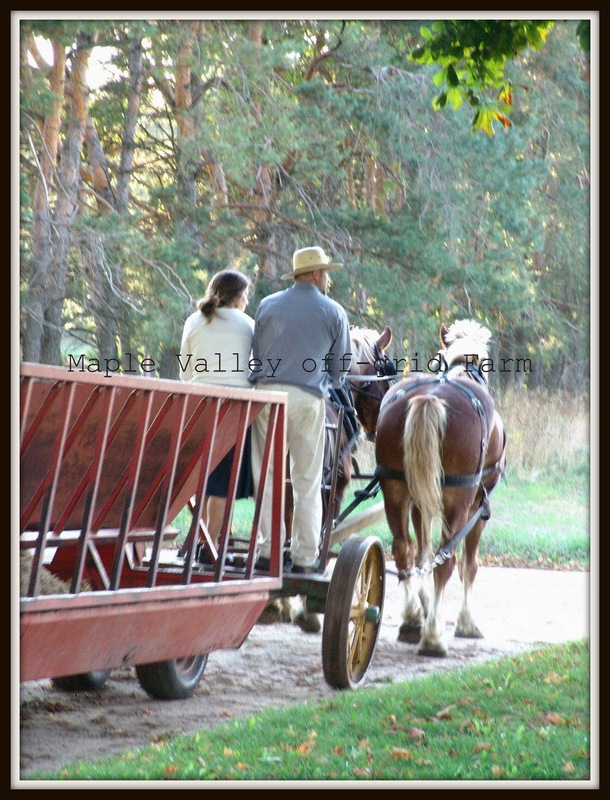 We purchased a 40-acre Amish farm almost 3 years ago. We moved in and we never brought it back on the grid. 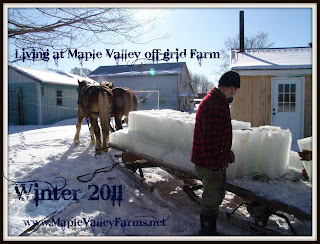 We use oil lighting, an ice house, Windmill engine pumped water or hand pumped. We have an outdoor privy and at this time there is no electricity on the 40 acres. We have 11 outbuildings, some in great shape and others in need of repair. Our farmhouse was built sometime between 1875-1890 as well as the barn. 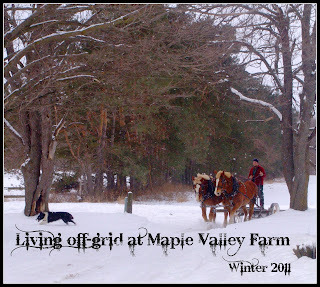 We farm completely with horses and no power equipment. The horses are a huge part of our farm and life here. We have 3 Belgians, Jim, Comet and Marge due to foal May 2011! We have goats, beef cattle, milking cows, chickens, pigs, cats, a dog, rabbits, 6 horses and soon to have Icelandic sheep so we can extend our sustainability to all things fiber. 3. You're living without electricity. Please tell us how you heat, get water, light your home, etc. We heat with wood, we cook with wood on a wood cook stove with a Pioneer Princess Wood cook stove all months out of the year. All of our water must be heated by fire. We use oil lighting, we have 1 pressure Leacock lamp (white gas fueled) for the kitchen around our dining table. Our windmill pumps with an engine to a holding tank into the top of our 100+ year old barn and then is gravity fed to the home. All animals are watered this way as well. We do not have a refrigerator. We can navigate pretty well in the barn at night with no lighting! 4. How has the adjustment to "off grid" been? 5. Were either you or your husband raised on a farm? 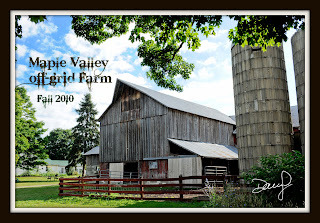 If not, what farm experience have you had before Maple Valley? My husband was raised on about 8 acres but he only had a few chickens and it was not in a predominately rural area. I was raised in a subdivision and I had a pet rabbit. We had no formal farming experience whatsoever before we married (going on 20 years this November) No one in our family was a farmer either. We learned as we went along. We started with a few pigs and then a 3 acre hobby farm and then it exploded and grew from there. 6. How do you animals get named? We do not name all of our animals as we have too many however, we do name the animals we spend the most time with as we get to know their personalities and their look. 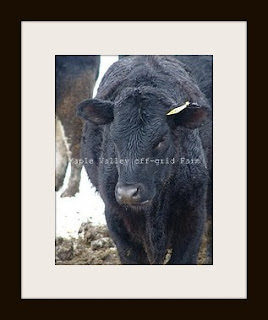 Some animals come named when we buy them so we just keep that name. 7. How has living on a farm effected your children? It has changed their lives for the better. They love it and they love the outdoors. They argue together and work out the problems as well together while chorin’. They have grown a lot. They have seen the fruits of their labors as well as the pain of an animal dying for no “reason” that they took care of greatly. They have seen the highs and lows of farming for sure, but in the end the good outweighs the bad. They would agree. 8. 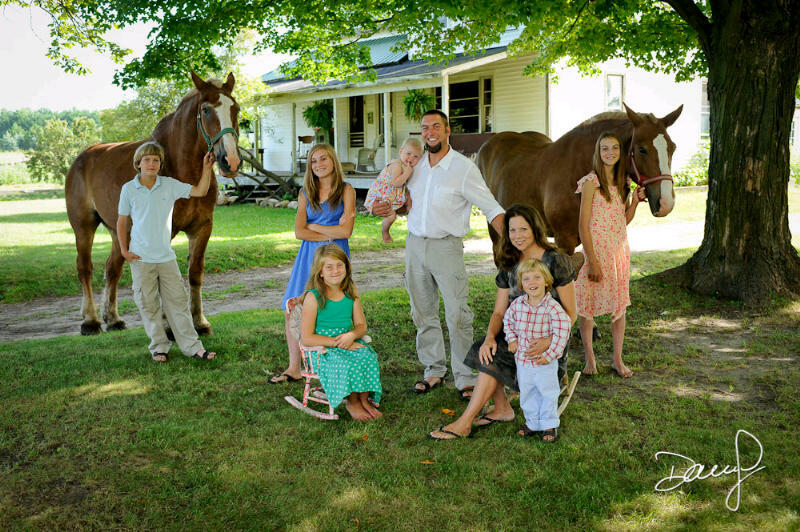 How do you balance home schooling your children and farm work? We balance it by including real life into our school. The children have even said how much they learn in real life. The girls ages 10, 14, and 17 can all bake cookies and cook dinners in a wood cook stove. The oldest bakes the best bread ever all by wood fire. Our 13 year old son plows with the horses and is in charge of the herd. We keep the book work to the most important things of the “3 r’s+” Reading, Riting and Rithmetic and of course science. The best and most important parts of their school day comes from hands on, real life learning. We make sure we have a ton of fun too! We can tell when everyone needs a break and we sneak away for a night to a hotel that is close enough that we can come home to milk in the AM and PM but then return to swim and frolic. 9. My husband and I are very familiar with Weston A. Price and the foundation that bears his name. We spent one year of our lives where one would have thought he was trying to be Joel Salatin and I was trying to be Sally Fallon. After that we had to find a happy balance to be who God made us to be. How has Weston Price influenced your farm? Your cooking? Honestly we really consider everything we put in our mouths now. Bad food and where it comes from is a huge turn off to us because we know what and where it has come from. We raise and eat our own grass fed beef, grass fed outside pork, grass fed chicken and eggs, organically grown fruits and veggies and our own raw goat and dairy milk. We do not eat processesed foods if we can help it. I won’t kid you, we do go to the grocery store because we cannot can enough all summer to keep up with our winter appetites. We have to pressure can all of our meats as we do not have refrigeration or slaughter in the deep winter to use the cold as our freezer. The balance for us is to only sell our grass-fed beef and occasional pork. We not farm chickens, veggies, fruits, milk shares, eggs etc only for us. We had to give up some things to sell as we need to do what works best for us here or we have our irons in too many fires. 10. Tell us about Maple Cottage. 11. What made you decide to have a YouTube channel for Maple Valley Farm TV? We want people to see what we are all about and why we do what we do. We hope it will encourage others to pursue their dreams and that they can see that you really can still live this way in a day and age of super technology! 12. What's in the future for Maple Valley Farm? Thank you to Angela for this interesting interview. 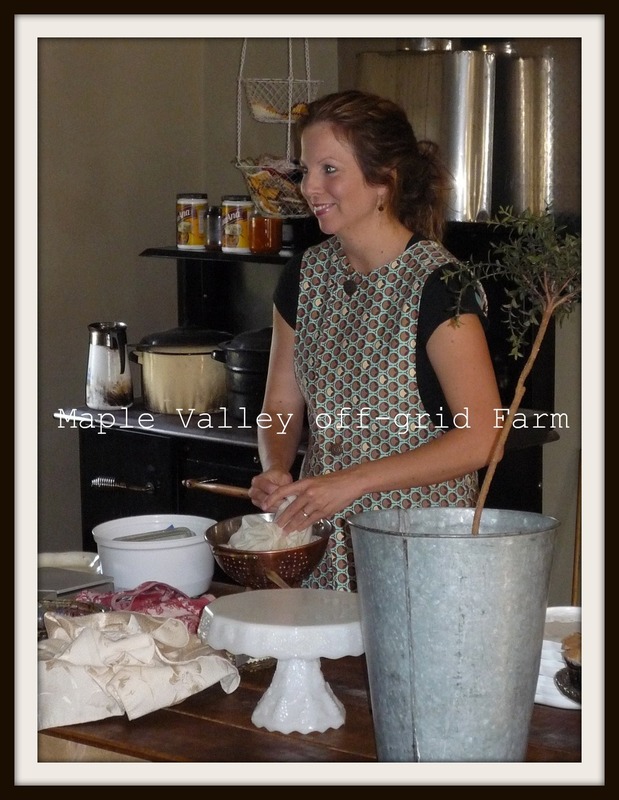 She is available to speak at home school conferences and you can access their farm website here. 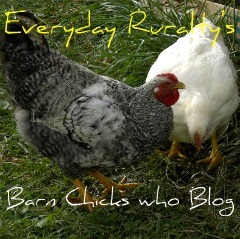 When you visit her blog, don't forget to check out her YouTube channel! Wow, that is really impressive. I went digging around on her blog to find out how she blogs from off the grid! I know I couldn't do it. Two words: disposal diapers. That is nice and I have always thought I would like to live off the grid. I think about it every time I open my electric bill. love this patrice! excellent pick! such hard work but not so different than my grandparents in vermont. Thanks for posting this fascinating interview Patrice. I admire so much the folks who give up the modern luxuries to live with the values of the past. If I were 30 again, this is something I would try but at nearly 70, I have become spoiled with electricity and other modern amenities, but love hearing about others who live off grid..and are young! Maple Valley Farms is about 45 minutes north of us! I was able to be fortunate enough and spend a day there this past fall and take a couple of classes. For my birthday my hubby got me a trip to the off-grid cottage that we will take in May! The family is truly living the good life and are amazing people.